These time tested carburetors can deliver more horsepower, fuel economy and dependibility than stock units. Experience noticeable gains in torque and better acceleration. Includes an assembled carburetor body, manifold adapter, all linkage, a washable air filter with chrome housing and complete installation and tuning instructions. 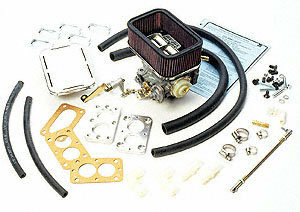 Most kits will deliver up to 18% increase in hp over factory carburetors while increasing fuel economy by 10-20%. The 32/36 and 38/38 designations refer to the diameter of the throttle bores in millimeters with a CFM of 300. Not legal for highway use in California. Unplugging stepper motor connections and re-routing of vaccuum lines to Weber fittings recommended for 82 & newer 6 cylinder (258c.i.). World of difference. I bought this to replace the old Carter carb on my '81 CJ7, wish I had done it sooner. It runs so much better. Very easy straight forward install. First time ever installing a carb, did it myself in my garage in about 90 minutes. Highly recommend! This thing is awesome. hooked it up, love it! Is this mechanic or electronic choke?